Although four division world champion Nonito Donaire had tasted defeat for the first time in twelve years when last seen in the ring, the Filipino Flash remained one of boxing’s premier fighters and an HBO attraction going into Saturday night‘s Featherweight grudge match with longtime nemesis Vic Darchinyan. Since the disappointing loss to two time Olympic gold medal winner and Super Bantamweight Champion Guillermo Rigondeaux on April 13th, 2013, Nonito welcomed his first born son, Jarel Donaire, into this world and reconciled with his father, trainer, and mentor, Nonito Donaire Sr.
With the time away from the squared circle, the 30 year old fighter felt genuinely excited about the sport once again, and wanted to use the return bout with “The Raging Bull” as a gauge in which to measure his current level of boxing proficiency. While most fight fans and boxing writers may not be able to determine his stature among the elite of boxing with last night’s performance, Nonito’s heart, grit, and physical durability was off the charts inspirational. Despite being a heavy favorite leading into the long awaited rematch, the Armenian born fighter gave Donaire Jr. everything he could handle in the squared circle. 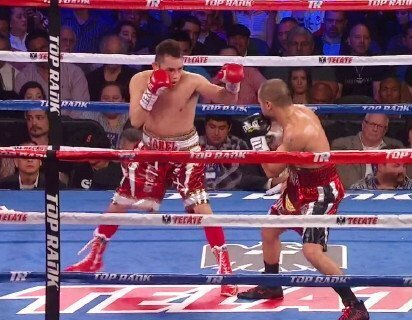 To begin the contest, Darchinyan uncharacteristically played the role of counter puncher and waited for his unsuspecting opponent to move forward and walk into an explosive left hand bomb. Although Donaire was respectful of the 37 year old fighter’s power, the marquee star ostensibly felt pressured into forcing the action and was eventually caught marching into several traps laid out by the crafty fight veteran as a result. Despite landing several punishing left hooks of his own, the harder and more effective shots throughout the majority of the contest seemed to be delivered by Vic Darchinyan. Going into the decisive ninth round of action, the three judges at ringside had Nonito trailing by a wide margin. Two of the three kings at ringside scored the bout through eight rounds, 78-74, or 6 rounds to 2, in favor of Darchinyan. One official ringside scorer saw the fight even with only two remaining stanzas. According to the official judges, Nonito needed a definitive knock-out to pull out a victory in Corpus Christi, Texas. With the crowd in attendance overwhelmingly in favor of the four division world champion, the Filipino Flash delivered in a big way. With one short left hook to the jaw of the determined veteran fighter, Darchinyan slumped down onto the light blue canvas, and the thousands who filled the American Bank Center erupted. Although the courageous, Armenian born puncher beat the initial count of referee Laurence Cole, Darchinyan was irrevocably hurt and seemed ready to go. Donaire quickly jumped all over his prey and pounded the reeling fighter until the third man in the ring called a halt to the action at the 2:06 mark of round number 9. Despite losing once again to Nonito Donaire Jr., the three division world champion deserves much credit for taking the heavily favored fighter to the brink and devising a very intelligent and effective game plan. After getting the hard earned victory, Donaire had much to say about the explosive contest. When asked by HBO color commentator Max Kellerman who he wished to fight next, the hard punching fighter replied with the consensus choice of opposition.